Whether you are new to social media marketing or a veteran, keeping up with the ever-changing landscape can be overwhelming. On a daily basis it seems like a new social network launches or a major update to an existing network changes everything. If you plan to remain successful, keeping up with the newest trends and understanding how to leverage them is imperative. However, if you are like many marketers you are probably scratching your head trying to figure out how to find the free time to do so. There are several ways to stay up to date with changes, including reading, talking with co-workers and watching videos. The problem with all of these methods is that they require 100 percent of your attention, and lets be honest, you do not have many hours in your day that you can commit 100 percent of your attention to. Luckily, podcasts help to solve this problem. Driving to work? Listen to a podcast! Cleaning your house? Listen to a podcast! The point is, podcasts are a perfect way to stay up to date with new trends and learn new tricks from the experts, without having to change your routine. Adding podcasts to your existing schedule allows you to learn more without committing additional time. 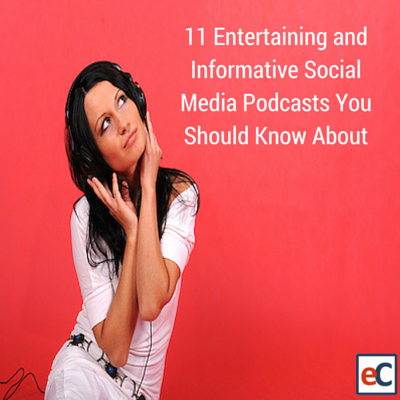 Below is a list of 11 podcasts that we believe will help you learn from the experts, understand new changes to the social media world and increase your social media marketing success. These podcasts are entertaining, value-packed and short enough to fit into even the busiest schedule. Oh, and they are all free! Hosted by Social Media Examiner’s Michael Stelzner, The Social Media Marketing podcast is an invaluable resource for social media marketers and entrepreneurs. Recorded once a week, Michael interviews industry experts, discusses new strategies and provides actionable advice on how to improve your social media marketing strategy. If you only have time to listen to one podcast a week, this is a great place to start. If you aren’t familiar with Gary Vaynerchuk, you are in for quite a treat. Gary’s style is laid back, extremely entertaining and down-right addicting. The premise of his podcast is simple, you ask the questions and he answers them. By using the hashtag #AskGaryVee on social media, you have the opportunity to ask questions that could be answered directly by Gary. The average length is 20 minutes, though you will wish it was a lot longer. You will find yourself laughing out loud throughout the episodes, so keep this in mind. The Social Pros Podcast takes a look at actual work that is being done by social media professionals. Each episode includes insights from leaders in the social media world, as well as new trends and tricks. Before an episode is over, the guest is challenged to quickly answer two important questions (knows as The Big Two). Typical episodes last 45 minutes and are packed with advice you can put into action immediately. We have been lucky enough to interact with Pam Moore several times over the past few years, both directly and in Twitter chats. Along with this podcast, we highly recommend participating in Pam’s Twitter chat, #GetRealChat, which take place at 9PM EDT on Tuesdays. Considered a top 10 social media influencer by Forbes, Pam’s track record speaks for itself. Listen to one of her podcast and you will immediately see, well hear, that she is passionate about her profession and helping those that are listening. Her average podcast lasts 25 minutes and she regularly uploads several podcasts per week. Much of Charlene’s success is a result of her unique ability to simplify the complex, while motivating action. Her podcast, Build Your Tribe, is no exception. It varies in length, anywhere between 15 minutes to an hour, but is always packed with information that will make you want to act immediately. Social media marketing may be the main focus of her show, but anyone that is involved in business will find useful advice and much needed motivation. Who doesn’t need a little motivation, right? Amy Porterfield is an accomplished author and online entrepreneur. She has made a living monetizing her actions online and in her podcast she shares how you can too. Amy loves helping small businesses succeed online, so the question is simple: are you ready to take your small business to the next level? This weekly, 30 minute, podcast is hosted by MarketingPros and is focused on all this marketing. They do a great job identifying real problems that you are probably facing and then provide information on how to tackle these problems. There is no shortage of great guest or engaging topics. Highly recommend this podcast for all marketers, not just social media marketers. Ready to be entertained? Mark Schaefer and Tom Webster take their subject matter seriously, just not themselves. Their laid back and fun approach makes learning enjoyable. They let you know what is going on right now in the marketing space, based on their personal experience, and also what to expect in the future. The average podcast lasts 30 minutes, so it is perfect for your commute to and/or from work. Joe Pulizzi is known as “the godfather of content marketing” and he certainly live up to the title. His podcast is perfect for entrepreneurs, startups and small businesses that are looking to grow their businesses. Instead of creating a product first and then marketing it, Joe believes businesses need to focus first on building an engaged audience and then selling will be much easier. Each of his episodes are short, usually 5 minutes or less, so fitting in a few episodes while you wash the dishes should be easy. With 300+ episodes recorded to date, Social Media Marketing Happy Hour is a serious resource for anyone that is interested in leveraging social media. Whether you are an expert of a newbie, Dawn and Traci will not disappoint. Their 15 minute podcasts episodes are jam packed with tips, tools and ideas that will make your life easier and your social media efforts more effective. Need an energy boost during your early morning commute? These two ladies’ happiness and energy is sure to rub off on you. Every week Eric interviews a different entrepreneur to try to uncover what has lead to their success, both personally and professionally. Some of the entrepreneurs he has interviewed include Neil Patel and Pat Flynn. All of these successful entrepreneurs discuss their biggest failures, tricks that have helped them grow and much more. Though this podcast isn’t solely focused on social media marketing, the content discussed will help you to grow your business and improve your marketing strategy. In the busy world we live in, podcasts present a unique opportunity to consume content without drastically changing our daily routines. Do you listen to podcasts? If so, let us know in the comment section below which podcasts you recommend. If you prefer to read, check out our list of 15 Books That Every Social Media Marketer Should Read.